↑ N.B. This date requires further review: some sources quote 1925. ↑ Flint, Peter B. (1992-05-07). "Marlene Dietrich, 90, Symbol of Glamour, Dies". The New York Times. http://query.nytimes.com/gst/fullpage.html?res=9E0CE6D7163CF934A35756C0A964958260&sec=&spon=&pagewanted=all. ↑ http://www.marlene.com/bio.html. N.B. This date requires further review: some sources quote 1939. ↑ Bach 1992, p. 20. ↑ Bach 1992, p. 491. ↑ "Fashion Icon: Marlene Dietrich". Stylehop. 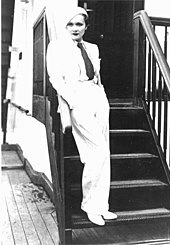 http://www.stylehop.com/fashion-blog/2009/04/21/fashion-icon-marlene-dietrich/। আহৰণ কৰা হৈছে: 2012-09-11. Bach, Steven (1992). Marlene Dietrich: Life and Legend. Doubleday. ISBN 0-385-42553-8. Riva, Maria (1994). Marlene Dietrich. Ballantine Books. ISBN 0-345-38645-0. Riva, David J. (2006). A Woman at War: Marlene Dietrich Remembered. Wayne State University Press. ISBN 0-8143-3249-8. Walker, Alexander (1984). Dietrich. Harper & Row. ISBN 0-060-15319-9. Spoto, Donald (1992). Blue Angel: The Life of Marlene Dietrich. William Morrow and Company, Inc.. ISBN 0-688-07119-8. Morley, Sheridan (1978). Marlene Dietrich. Sphere Books. ISBN 0-7221-6163-8. Carr, Larry (1970). Four Fabulous Faces:The Evolution and Metamorphosis of Swanson, Garbo, Crawford and Dietrich. Doubleday and Company. ISBN 0-87000-108-6.